16-Nov-2006 -- The target was at the north-east of the mountain side. Last week, I went over the mountain from the east side down. 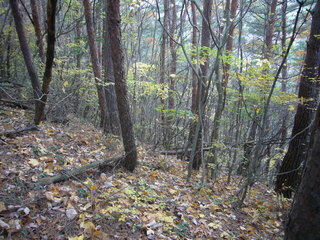 It seemed to be hard to climb the steep slope of the mountain. After returning home, I checked the topography, and found that it was easy to approach from the mountain top where I could reach by car. I drove the car and followed the way to the top on mountain named Ohshiro Mt. There was an observatory and I could see the whole town of Tastuno from the top of the hill. The confluence was 600 meters north-east from the top. The pass to the north guided me to point about 200 meters ENE to the target. It was east to walk in the forest because the back ran to the east. The target was about 10 meters north side of the back. During the approaching, the signal was too weak to locate the position with my GPS, so I wondered over 15 minutes. #7: A gateway at the hiarpin bend, 200 meters to the point.